Just a few days ago I was plant shopping at a local nursery. A young couple was selecting violas and tulip bulbs, and the young lady spied a beautiful Japanese maple, and exclaimed: “What a beautiful tree – let’s be sure to plant one of those next spring!” Of course, I turned to the couple and declared “Don’t wait until spring – you can plant it now!” They were surprised to hear this, and said they thought once cold weather arrived, it was too late to plant a tree. It’s a common misperception that when fall arrives, it’s too late to plant – but do you know why experts insist fall is the best time to plant most shrubs and trees? When planted in fall, the plant becomes happily dormant above ground soon after planting, but the roots continue to grow and have several months to become comfortable and strong in their new home. When spring does arrive, the plant is established and ready to put out strong leaves, new top growth, and lots of flowers. If you wait until spring to plant, the shrub or tree must acclimate itself to its new home and begin growing immediately. At the same time, it has to produce leaves, flowers, and then endure the rapidly arriving summer heat. 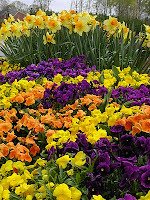 So the difference is obvious: fall planting gives your plant’s roots a wonderful “head start” over spring planting. Fall is the best time for planting many ornamental plants in Georgia. In my opinion, you can’t go wrong if you consult the Georgia Gold Medal plant list. Each year, the Georgia Gold Medal Plant Committee selects flowers, shrubs, trees, groundcovers and vines that are well-adapted throughout most of Georgia, readily available and provide seasonal interest. An added bonus is that all are low maintenance once established! Lenten Rose (Helleborus orientalis) – A shade tolerant, deer resistant, flowering evergreen groundcover. Planted in moist, nutrient-rich soil, this plant is outstanding in a forest setting and in shady borders. This winter bloomer’s flowers can last 8-10 weeks and come in shades of green, cream, magenta, plum and rose. Lavender Twist® Redbud (Cercis canadensis “Covey”) – This beautiful specimen tree grows up to 15 feet tall and wide and thrives when planted in moist, well-drained soils with full sun to partial shade. Lavender, pea-like blossoms precede heart-shaped leaves in summer, and this deciduous tree’s bare branches create a beautiful sculpture in winter. Arkansas Blue Star (Amsonia hubrectii) – This deer resistant perennial is a traffic stopper in fall, when the foliage turns golden yellow and glows when sunlight strikes it! Drought tolerant and low maintenance once established, amsonia’s light blue star-like flowers emerge from feathery stems in spring. Plant in full sun to partial shade. ‘Pride of Augusta’ Carolina Jessamine (Gelsemium caroliniana ‘Pride of Augusta’ ) – Adding vertical interest, this vine is a beautifully reliable addition to the garden. Evergreen and flowering from January – April and sporadically through the year, this yellow double-flowering vine is easy to establish and train on a trellis, fence or wall, is noninvasive, and deer resistant. Plant in full sun to partial shade for best results. Autumn Fern (Dryopteris erythrosor) – Ferns are lovely in the landscape, and this variety is ideal for a shady, moist area. New fronds unfold a bright, coppery red, and then gradually fade to olive green. Although freezing temperatures, ice and snow sometimes burn the foliage, the plant is reliably evergreen in most parts of Georgia. For a complete list of Georgia’s Gold Medal Winners, go to: http://ggmp.uga.edu/index.html.